#14 Budapest, Hungary: Shall I Compare Thee? ﻿﻿﻿My visit to Budapest seemed to have passed in a flash. First of all Budapest was not part of the much awaited Eastern European Study Tour program. It just so happened to be on the itinerary of this substitute trip, so I did not have time to check out any travel guides on Budapest. My introduction to Budapest was merely gathered from the requisite briefing given by the tour director prior to arriving at the next destination. Our tour director stated, “The Danube River flows through Budapest which divides the city into 2 parts – Buda and Pest. The name of the city, literally, comes from combining Buda and Pest. Buda is hilly and the older part of the city while Pest is flat and the newer and commercial part of the city…” Our tour director also mentioned on various occasions that her 2nd favorite city (2nd to Paris) is Budapest. Since Budapest was often compared to Paris, and I was particularly familiar with Paris, I thought I would explore the city on my own. So I started to get ahead of myself and started mapping out what to do in Budapest outside of the organized tour. Our hotel was near the train station on the Buda side. There was a market at the back of the hotel, but not much eating places. The more popular eating places could be found across the river, on the Pest side. But getting to Pest from the hotel could be tricky. One had to cross Chain Bridge and walk through the tunnel. Our tour director advised us against walking through the tunnel because of a foul smell, and advised the ladies to carry their bags facing the wall side. I thought she just did not want to alarm us, but I took it as a heed to watch out for pickpockets. My sister and I invited our new-found friend, Lucy, a fellow traveller to join us on this culinary adventure. We saw a listing of recommended restaurants from our hotel. It included Gundel, Alabardos, and Arany Hordo. 'Michelin-starred' Gundel is grand and elegant. Alabardos has a romantic and clubby atmosphere. Arani Hordo described as laid-back with cavernous wine cellar under the more than 400 year old building. Gundel, which was listed in the book “1,000 Places...,” was quite a distance from our hotel. Besides, I was not feeling ‘elegant’ after a long trip from Vienna. So we settled on Arany Hordo located in the Castle Hill area and a 10-minute walk from our hotel. The walk uphill would have been a challenge as it was quite a hill, so we decided on taking a taxi. When asked for direction to the restaurant, the concierge specifically advised us to take the ‘CITY’ taxi. The fare should be no more than 1300.00 HUF, which was roughly the equivalent of 5 euros. Our taxi ride to the restaurant cost 4 euros. (By the way, the currency of Hungary is called Forint, denomination in HUF, but the euro is widely accepted). 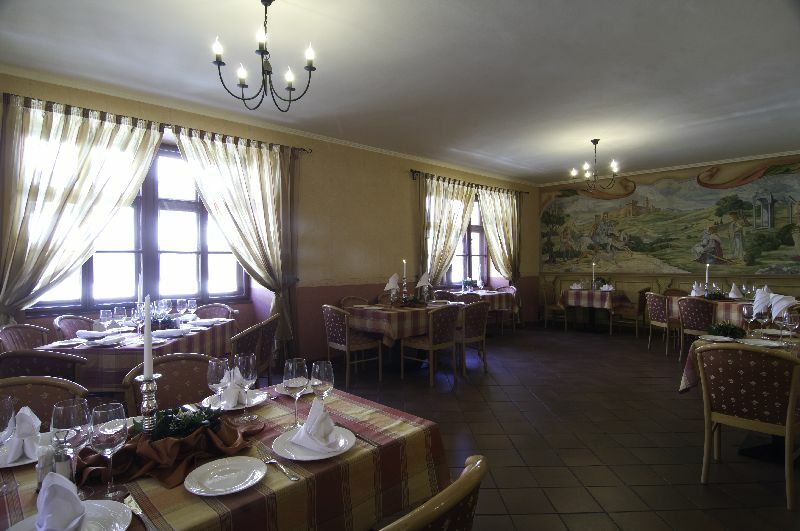 The Arany Hordo was a pleasant restaurant. We were greeted by a string quartet as we walked in. All the tables downstairs seemed to be occupied, but the host gestured to follow him upstairs. In contrast, none of the tables upstairs was occupied. The décor upstairs was more muted. We could still hear the music, but it was a truly relaxed atmosphere. There was an extensive list of local dishes on the menu with prices that would make you think you’re in your neighborhood restaurant. Since we wanted to try the local dishes, we ordered different dishes to share: pork with liver and sausage, chicken on a bed of mash potato and vegetables, sausage with bacon and pickled vegetables. The wine selection was extensive. The wine was excellent and the dessert yummy. The waiters seemed to know their business. While we drifted on a conversation with Lucy (more like trying to get to know this young, smart-looking, take charge woman from Indonesia, who was traveling solo), the waiters were unobtrusive and brought our food on cue. We essentially got first-rate food at a budget price. Everything was perfect so far! No one thought about calling for a ‘CITY taxi’ after dinner. As we stepped out of the restaurant, there was a cab waiting for us. At first, the cab driver seemed to be preoccupied with paper work and gave the impression that the cab was not free. Then he gestured for us to get in the cab. The taxi-driver, who was good-looking, volunteered some information about him, giving us the impression that he was a hard-working, honest working student. It turned out to be a classic set-up to rip us off big time. The lesson here is that we did not pay attention to the concierge emphasis on taking the ‘CITY’ taxi. The following morning we joined our fellow travellers on an organized sightseeing tour. Andrassy Avenue on the Pest side was the first highlight of this tour. The avenue is lined with trees, upscale and specialty shops, and neo-renaissance residential mansions that it has been compared to the Champ Elysees in Paris. Andrassy (Ut) Street has been named a UNESCO world heritage site for the large number of 19th century restored and preserved buildings along its way. Some of the notable buildings are the House of Terror – a memorial to the victims of fascist and communist regimes, the Hungarian State Opera House, Kodaly Korond, Kodaly Zoltan Memorial house/monument. Andrassy Avenue crosses the Oktogon and ends at Heroe’s Square where you would find the Millennium Monument in the middle of two art museums - the Palace of Art and the Museum of Fine Arts, and the entrance of the City Park. Széchenyi Medicinal Bath – a beautiful baroque building, known to be the largest medicinal bath in Europe. Vajdahunyad Castle – a copy in part of a castle in Transylvania, Romania, but with other architectural (Gothic, Renaissance and Baroque) element added. Our tour bus drove past many fascinating buildings, from neo-Gothic to Baroque - the Parliament Building, Jewish Synagogue and St. Stephen Cathedral. The Fisherman’s Bastion – with a viewing terrace in neo-Gothic and neo-Romanesque Style. This is the best vantage point to take in the views of the Danube River, the bridges, the parliament house and across Pest. The Royal Palace – the home to the National Gallery Museums and 3 other museums. St Matthias Church – a neo-Gothic church. Some parts of the church were closed for renovation. Today the emphasis is on the colorful roof tiles. During the Castle Hill tour, our local tour guide mentioned the oldest pastry shop that could be found in the area. She did not give us the exact address, and there were a few old looking coffee and pastry shops. But the Ruszwurm Cukraszda was hard to miss. We just looked for the coffee shop with the longest line. The most popular item from this pastry shop is the Eszterhay Torte, which is basically a layer of chocolate, cream and crispy wafer. I felt as if I unearthed a gem. The cake was supposed to be made the same way it was made 200 years ago. The whole Castle Hill neighborhood has been designated a UNESCO World heritage site. This is the main church of Budapest, a prime example of neo-classical architecture. The church façade lured us to go inside and explore. While the high dome of Stephen Church can be seen from anywhere in the city, seeing it from a different perspective (from inside the church) was fascinating. The inside is very ornate, rich in gold inlays. The marble statue of St. Stephen is the altar center piece. The consecrated right hand of the first king of Hungary is kept inside the chapel. We went up to the cupola to see an amazing view of the city. We continued to explore the surrounding area, mainly coffee shops and five-star hotels. Well, you can’t go to Paris without shopping. So we did a little shopping. The clothes seemed to be inexpensive. But you have to be careful and ask the store clerk about taxes. The sales tax here could be as high as 25%. After a walk by the riverbank, it was nice to kick back and relax and watch the time go by. There’s no better place to do this than at the Intercontinental Hotel Lobby. You can relax at the lobby or sit outside on the terrace and have coffee. You’ll have a view of the Buda side and the Castle (Royal Palace) and much of the Buda side. It’s close to the chain Bridge so that if you’ve gathered enough energy and would like to do more exploring, you can walk across Chain Bridge and take the ‘funicular’ to the Castle Hill. This evening I felt elegant as if I were going to the opera. Maybe I was sold on the optional excursion advertising, “At entering the boat you are welcomed by a glass of champagne… During dinner, a 4 course meal will be served - mixed cold plate, asparagus cream soup, chicken or turkey joasszony-style, and somloi galuska for dessert…white or red wine, mineral water and coffee at the end. ” The 4 course dinner turned out to be a big disappointment. I had better airline food. To be fair: one could easily ignore the food, given the utterly beautiful views. At night, the dramatic views from the left bank (Buda) and the right bank (Pest) compete for the visitor's attention. The Royal Palace, the steeple of St Matthias Church and the Fisherman’s Bastion in the Castle Hill area, bathed in lights, proudly stood to show off their glorious past. On the right bank, the modern commercial buildings, the neo-Gothic and neo-Baroque church domes, seemed to stand aside to give the Parliament building the spotlight. The Parliament building appeared to be immaculately maintained, stood tall and extremely elegant, as if to return the courtesy. The bridges draped in pink lights (in honor of Breast cancer month) played a minor role in this dramatic opera. The view from the boat was no dress rehearsal. It was the finale where the audience remained in a standing ovation for a long time - a sign that the players were equally impressive. There was no super diva. The drive to Andrassy Street and the visit to St. Stephen Church brought vivid memories of the ‘Humanities’ class I took many years ago. Some of my schoolmates ridiculed the instructor for her enunciation of ‘renaissance and baroque’ – strange-sounding words to us then. The only reason the students took the class was because it did not require much reading. It was a large class held at the auditorium where the instructor tried to keep the student awake with her movie projector on Renaissance and Baroque arts. Now, remembering Ms. Tan, our Humanities instructor, draws a smile and renewed appreciation. Although we’ve covered all the world heritage sites during the sightseeing tour, I did not get enough of Budapest. Budapest has many museums and fabulous art scenes to offer. If I were to compare Budapest to Paris, then I surely would go back to Budapest. Like Paris, you can't get enough of Budapest in one visit.